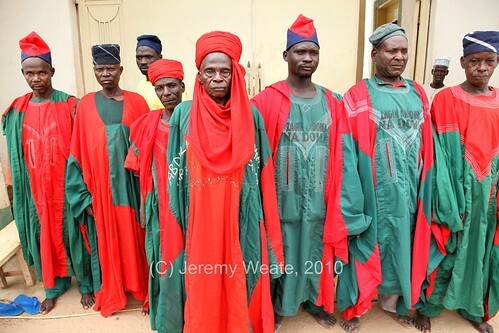 Guards at the Andoma's palace, Andoma, Nasarawa State, originally uploaded by nobodaddy69. Jeremy, in contrast with your visit to Niger state, where nearly everyone was ethnically tagged. Your sojourn in Nasarawa state, didn't identify anyone by ethnicity. I know very little about the state. Those old folks, look like some kind of body guard 'dongari' - I believe is the Hausa name. But their ruler didn't dress in the all too typical Hausa - Fulani manner, with "rabbits ears" adorning their cap encapsulated in a turban, and the figure being draped in yards of cotton. So I'm not too sure as to their ethnic identity. I'll check out the reference, kind of surprised you responded directly. I didn't think they were Hausa, but the uniforms of the 'body guards' is a Hausa styley, and the Arab/Palestinian scarves worn by the counsellors pointed to a culture influenced in no small way by the Middle East. It would be interesting to hear what is it about each state you like the most. It wouldn't be fair to ask you your favourite, as this might not go down too well with those that failed to make the short list, and might put you in an uncomfortable position. I can see Cross River is definitely up there, and any state with a large Fulani presence(we are all too aware of their rustic and natural charm). They are literally true Middle-Belters, neither north nor south. The wikipedia reference is interesting, they have a noble past of resistance against the odds, good on them.